Melioidosis, a severe human disease caused by the bacterium Burkholderia pseudomallei, has a wide spectrum of clinical manifestations ranging from acute septicemia to chronic localized illness or latent infection. Murine models have been widely used to study the pathogenesis of infection and to evaluate novel therapies or vaccines, but how faithfully they recapitulate the biology of human melioidosis at a molecular level is not known. In this study, mice were intranasally infected with either high or low doses of B. pseudomallei to generate either acute, chronic, or latent infection and host blood and tissue transcriptional profiles were generated. Acute infection was accompanied by a homogeneous signature associated with induction of multiple innate immune response pathways, such as IL-10, TREM1, and IFN signaling, largely found in both blood and tissue. The transcriptional profile in blood reflected the heterogeneity of chronic infection and quantitatively reflected the severity of disease. Genes associated with fibrosis and tissue remodeling, including matrix metalloproteases and collagen, were upregulated in chronically infected mice with severe disease. Transcriptional signatures of both acute and chronic melioidosis revealed upregulation of iNOS in tissue, consistent with the expression of IFN-γ, but also Arginase-1, a functional antagonist of the iNOS pathway, and was confirmed by immunohistochemistry. Comparison of these mouse blood datasets by pathway and modular analysis with the blood transcriptional signature of patients with melioidosis showed that many genes were similarly perturbed, including Arginase-1, IL-10, TREM1, and IFN signaling, revealing the common immune response occurring in both mice and humans. Melioidosis, a severe human disease caused by infection with the environmental Gram-negative bacterium Burkholderia pseudomallei (1), is an important cause of community-acquired sepsis in Southeast Asia and northern Australia where it is endemic. However, its known distribution is expanding with cases of melioidosis now being reported in numerous other countries (2). Infection results mainly from inhalation during the rainy season or from percutaneous inoculation (through direct contact with soil and water) (1). The severity of the disease has a wide spectrum of clinical manifestations. Acute fulminant septic illness is characterized by bacteremia and induction of an extensive cytokine response (3, 4). In contrast, chronic localized infection is generally less severe with internal-organ abscesses and secondary foci in the lung, spleen, liver, and skeletal muscle, which persist and are difficult to eradicate (5). Sterilizing immunity does not occur and bacteria persist either subclinically in a latent form or as a chronic localized infection. Recurrent melioidosis is common and is usually due to relapse from a persistent focus of infection rather than to reinfection (6). Reactivation in some individuals has also been reported after decades of latency (7). Despite the increased research efforts since B. pseudomallei was classified by the U.S. Centers for Disease Control and Prevention as a Category B bioterrorism agent, the mechanisms of persistence and pathogenesis are still poorly understood, and it is still unclear how B. pseudomallei can evade the immune response and cause significant human disease. Murine models of melioidosis have been used extensively to study the immune responses induced following infection and to screen new vaccines and therapies (5, 8–10). Acute models, following either i.v. or the more physiologically relevant pulmonary route of B. pseudomallei infection, are characterized by the presence of bacteremia, neutrophil-dominant inflammation and uniformly rapid death (5, 8–10). We have also described a model of chronic melioidosis where granulomatous pathology, fibrosis and heterogeneity of disease progression are the main features within the infected animals (11). These models highlight the importance of neutrophil recruitment and IFN-γ–mediated macrophage activation (12) in host resistance, but how B. pseudomallei resists elimination by these cell-mediated immune responses is not known. Taken together, the acute and chronic mouse models share features resembling the heterogeneity of the clinical manifestations of human melioidosis; however, which of these models more closely resembles the human disease at a molecular as well as clinical level has not been addressed. Whole genome transcriptional profiling has previously identified a blood signature in patients with septicemic melioidosis, which included genes related to inflammation, Ag processing and presentation, IFNs, neutrophils, and T cells (13–15). Transcriptional analysis of liver and spleen has been performed in a model of acute melioidosis by i.v. challenge (16) showing altered expression of genes involved in inflammation, TLR signaling, and complement pathways. However, the transcriptional signature of acute and chronic melioidosis postinfection via the airways, a natural route of transmission, has not been reported. In particular, a detailed molecular analysis of the global transcriptional response induced by infection with B. pseudomallei in different experimental models and how this compares with human disease has not been performed. In this study, we have performed whole genome transcriptional analysis of tissue and blood of mice following pulmonary challenge with B. pseudomallei, during acute and chronic infection, and compared this to the blood transcriptional profiles of patients with acute melioidosis in northeast Thailand. B. pseudomallei strain 576 was isolated from a patient with a fatal case of human melioidosis in Thailand, and was provided by Dr. T. Pitt (Health Protection Agency, London, U.K.). Frozen stocks were prepared as described previously (8). All procedures involving live bacteria were performed under Advisory Committee on Dangerous Pathogens containment level 3 conditions. Female C57BL/6 mice (Harlan Laboratories, Bicester, Oxon, U.K.) aged 6–10 wk were used in accordance with the Animals (Scientific Procedures) Act 1986 and approved by the London School of Hygiene and Tropical Medicine Ethical Review Committee (70/6934). Aliquots of bacteria stocks were thawed, diluted in pyrogen-free saline and administered intranasally in 50 μl containing 2500 CFU (acute model) or 100 CFU (chronic model) as described previously (11). Control uninfected mice received 50 μl pyrogen-free saline. At different time points, mice were euthanized to determine the number of CFU in blood, lung, spleen, and liver as described previously (11). The limits of detection were 50 CFU/organ or 20 CFU/ml blood. Mice were euthanized by terminal anesthesia with pentobarbital (Euthatal; Merial, Essex, U.K.) and whole blood collected into Tempus tubes (Applied Biosystems, Paisley, U.K.); 1:2 ratio (blood:Tempus reagent). Samples were immediately vortexed to avoid blood clotting and stored at −80°C until RNA extraction. Lung and spleen were harvested in 2 ml cold TRI-Reagent (RiboPure RNA kit; Life Technologies, Austin, TX), homogenized (Polytron PT 1600 E System; Kinematica, Lucerne, Switzerland) and stored at −80°C until RNA processing. The PerfectPure RNA Blood kit (5 PRIME, Hamburg, Germany) was used for whole-blood RNA extraction, following manufacturer’s instructions. Globin mRNA was depleted from 2 μg total RNA blood samples using the GLOBIN-clear Mouse/rat kit (Ambion, Life Technologies). Lung and spleen RNA were extracted from tissue homogenates using the RiboPure Kit, according to manufacturer’s instructions. RNA concentration was determined (NanoDrop 1000; Thermo Scientific, Wilmington, DE), and RNA integrity values were assessed (LabChip GX; Caliper Life Sciences, Hopkinton, MA). Samples with RNA integrity values > 6 were retained for further processing. RNA (300 ng/sample) was amplified (Illumina TotalPrep RNA Amplification Kit; Applied Biosystems). cRNA (1.5 μg/sample) was hybridized overnight to Illumina Mouse Whole Genome WG6 V2 BeadChips (Illumina). BeadChips were washed, blocked, stained and then scanned on an Illumina iScan, as per manufacturer’s instructions. Genome Studio 2.0 software (Illumina) was then used to perform quality control and generate signal intensity values. Raw background subtracted data from Genome Studio (Illumina) were generated and then analyzed using GeneSpring GX 12.1 software (Agilent Technologies). Signal values were set to threshold level 10, log2 transformed, and normalized using a 75th-percentile shift algorithm. Next, per-transcript normalization was applied by dividing each mRNA transcript to the median intensity of all the samples. Transcripts were filtered out if at least 10% of the samples failed to pass a “present” flag cut off set at 0.99 (detection p > 0.01). The above normalized and quality controlled data were used to identify differentially expressed transcripts having at least 2-fold expression value changes from the median of all transcripts in at least 10% of all samples, which passed Mann–Whitney U test with Benjamini–Hochberg false-discovery rate correction between infected and uninfected mice (p < 0.01). Heat map dendrograms of differentially expressed transcripts were generated by clustering with Pearson Uncentered distance metric and the Average Linkage rule on transcripts, unless otherwise stated. All data collected and analyzed adhere to the Minimal Information about a Microarray Experiment guidelines. Mouse microarray data were deposited in the Gene Expression Omnibus (accession number GSE61106). For Figs. 1 and 3, significant transcript lists were identified by stringent statistical filtering comparing infected to uninfected mice (Mann–Whitney U test plus Benjamini–Hochberg correction; p < 0.01) on data normalized to the median of all transcripts across all samples and passing a detection value (p < 0.01) and 2-fold expression value across at least 10% of samples within GeneSpring GX12.1 statistical software. Weighted molecular distance to health/uninfected (MDTH) was calculated as described previously (15). MDTH was determined for each dataset by computing the “molecular distance” between each B. pseudomallei–infected sample in relation to all uninfected control samples. Qualifying genes differed from the average baseline expression by at least 200 and 2 SDs. Nonparametric one-way ANOVA (Kruskal–Wallis) with Dunn’s post hoc test was applied between sample groups **p < 0.01, ***p < 0.001, and ****p < 0.0001 between uninfected group are indicated. Significant transcripts (811) were identified by comparing B. pseudomallei–infected mice without bacteremia (n = 7) to uninfected (n = 8) (Mann–Whitney U test plus Benjamini–Hochberg correction; p < 0.01) on data normalized to the median of all transcripts across all samples and passing a detection value (p < 0.01) and 2-fold expression value across at least 10% of samples. Lesion scores were applied to generate a supervised heat map of the identified transcripts. Bacterial counts from spleens were allocated into two groups according to the presence or absence of visible lesions. Ingenuity Pathway Analysis (IPA; Qiagen, http://www.ingenuity.com) knowledge base was used to identify statistically significant pathways (Fisher’s exact test; p < 0.05) associated with differentially expressed transcripts (p < 0.01 after Mann–Whitney U test and Benjamini–Hochberg correction) following B. pseudomallei infection of blood or tissues (lung and spleen). A list of 3468 genes associated with an immune Gene Ontology (GO) function was generated by search within IPA (March 19, 2014) and the Mouse Genome Database at the Mouse Genome Informatics Web site (The Jackson Laboratory, Bar Harbor, ME) (http://www.informatics.jax.org) (March 30, 2014). At necropsy, lung and spleen samples were fixed in 10% formalin and routinely processed for histopathology. Four μm thick sections were stained with H&E or used for immunohistochemistry. Sections for immunohistochemistry were dewaxed and hydrated in TBS (0.005 M Tris [pH 7.6] and 0.85% w/v NaCl). For detection of Arginase-1, sections were incubated for 5 min with 1% NaDodSO4 in TBS before endogenous peroxidase activity was quenched with a methanol/hydrogen peroxide block for 15 min. Slides were assembled into Shandon cover plates (Shandon, Florence, KY) and incubated subsequently at room temperature with avidin/biotin block (Bloxall, Vector Laboratories, Peterborough, U.K.) for 10 min, M.O.M. Ig Block (Vector M.O.M. Immunodetection Kit; Vector Laboratories) for 1 h, mouse anti–Arginase I Ab (BD Transduction Laboratories) 1/250 in M.O.M. diluent for 45 min, M.O.M. biotinylated anti mouse IgG (Vector Laboratories) for 10 min and avidin-biotin-peroxidase complex (Vector Laboratories) for 30 min and washed three times with TBS between incubations. Sections for iNOS detection had their endogenous peroxidase activity quenched followed by an epitope unmasking with Dako pH 9 buffer (DakoCytomation) for two periods of 5 min at 800 W in microwave and sequential incubation with avidin biotin block, normal serum block for 30 min, rabbit anti-iNOS/NOS II polyclonal Ab (Millipore) 1/500 or in TBST for 1 h, goat anti-rabbit biotinylated secondary Ab (DakoCytomation) 1/1000 in TBS for 30 min and the avidin-biotin-peroxidase complex. Primary Abs were substituted by homologous IgGs (isotype control) as negative technique controls. Samples were imaged using a Zeiss axioplan 2 microscope (Carl Zeiss, Welwyn Garden City, U.K.) fitted with a Retiga 2000R Fast CCD camera (QImaging, Marlow, U.K.) using Volocity software from Improvision. Whole blood transcriptional microarray data (Illumina Hu6 V2 Beadchips) from our already-described Training and Test cohort of melioidosis patients and healthy controls (15) were reanalyzed. The Training group contained 11 patients and 10 healthy controls, while the Test group contained 13 patients and 9 healthy controls. Differentially expressed transcripts were identified from quality control filtered data (transcripts detected in at least 10% of all samples at detection p < 0.01 and passing a filter of 2-fold median intensity value and 200 intensity units across all samples) by Mann–Whitney U test and Benjamini–Hochberg false-discovery rate correction between patients and healthy controls (p < 0.01) as above. Of the genes represented in the Illumina whole genome mouse arrays (WG6 V2), 19,945 had annotated Entrez IDs. Of the 20,268 annotated human genes, 15,976 had mouse orthologs based on the IPA knowledge base. For the 1292 genes common between human Training and Test Sets that were significantly changed in human melioidosis, 1131 had mouse orthologs, which were included in subsequent analysis. To compare human and mouse data at the modular level, we used the previously described Affymetrix-derived human module system (17) and translated the module lists to accommodate mouse genes based on Entrez IDs. The 2051 Illumina/AffyIDs used to compute the Affimetrix Modules were entered into IPA, resolving 1,832 genes common to the Human Illumina Hu6 V2 and Mouse WG6 V2 arrays (17). Raw values for the common 1832 human-mouse genes were used to generate module heat maps. Percentages of significantly expressed upregulated or downregulated genes (Student t test; p < 0.05 comparing infected and uninfected) in each module are represented by colored intensity areas. Our initial aim was to investigate whether the blood transcriptional signature of mice infected via the airways with B. pseudomallei could reflect transcriptional changes in the lung. Genomewide transcriptional profiles were generated from blood and lung samples from acutely infected C57BL/6 mice at days 1 and 3 postintranasal infection with 2500 CFU B. pseudomallei 576. Typically, their bacterial load in the lung at day 2 was around 106 CFU and increased up to 108 CFU by day 3, whereas 103 CFU where detected in the blood by day 2 and these mice usually die at day 4 postinfection (data not shown). Unsupervised analysis of blood and lung samples showed that the transcriptional profile of the groups segregated according to infection as shown by principal component analysis (PCA) (Supplemental Fig. 1). Statistical filtering (p < 0.01 Mann–Whitney, Benjamini–Hochberg correction of infected versus uninfected mice using GeneSpring analysis) resulted in two main dendrogram clusters based on similarity of gene expression, showing 1325 and 2041 transcripts differentially expressed in the blood and lung, respectively, of infected as compared with uninfected mice at day 1 (Fig. 1A). A greater number of differentially expressed genes consisting of 4810 and 4076 transcripts was observed, respectively, in the blood and lungs of mice at day 3 postinfection compared with uninfected controls (Fig. 1A). The top 5 IPA canonical pathways upregulated at both time points in blood and lung were highly enriched for granulocyte adhesion and diapedesis, IL-10 and TREM1 signaling and other pathways involved in innate immunity (Fig. 1B). The IFN signaling pathway was one of the top upregulated pathways in the blood but not in the lung at the early time point. Other upregulated pathways included hepatic fibrosis and acute phase response. The top 5 downregulated pathways in both blood and lung at days 1 and 3 largely consisted of B and T cell–associated genes (Fig. 1C). 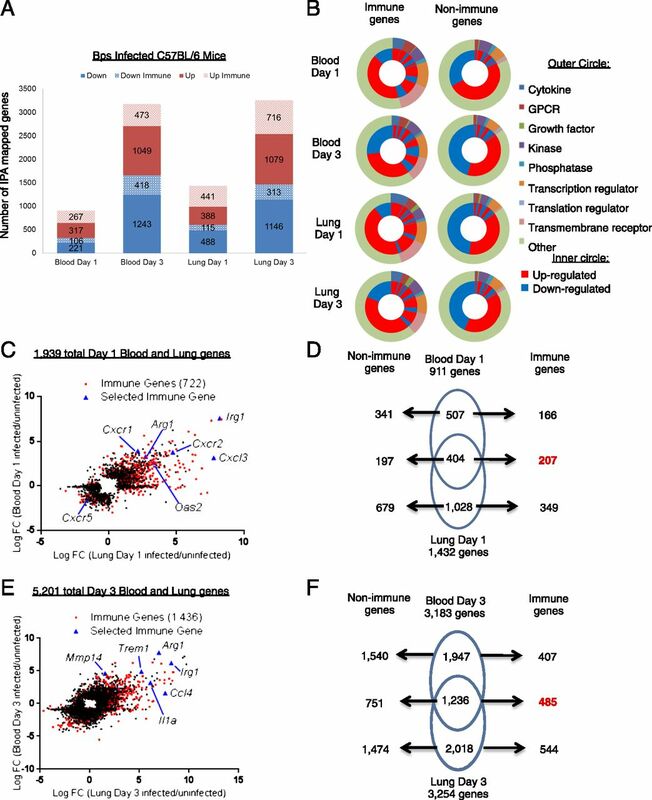 The transcriptional signature showed 561 transcripts were common to the blood and lung at day 1 and represented 404 genes identified by IPA (Fig. 1D). The 1618 common transcripts detected in both blood and lung at day 3 postinfection represented 1236 genes (Fig. 1E). 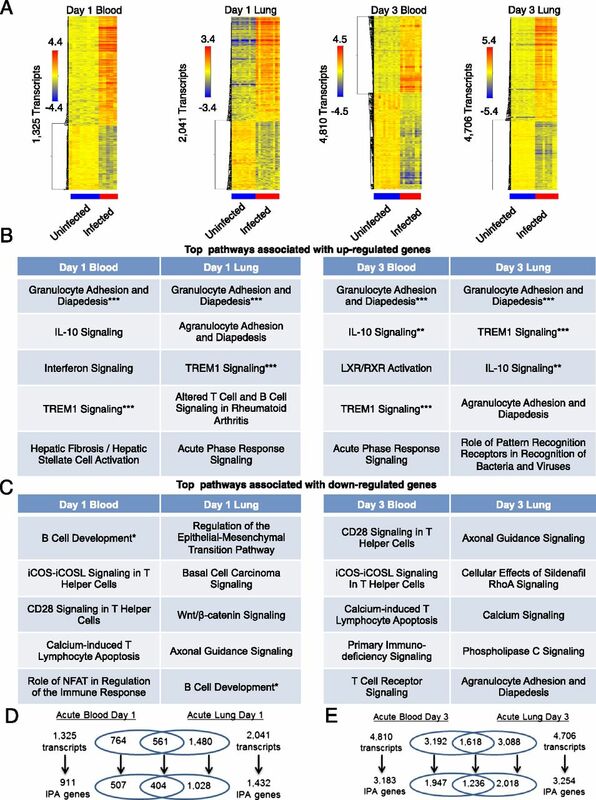 Mouse blood and lung transcriptional signatures are associated with similar and distinct canonical pathways after acute B. pseudomallei infection. (A) Heat maps of normalized expression values of blood day 1 (infected n = 5, uninfected n = 8), lung day1 (infected/uninfected n = 10), blood day 3 (infected n = 9, uninfected n = 11), and lung day 3 (infected n = 9, uninfected n = 10) differentially expressed transcripts. Scale bar represents log2 fold change of up (red) or downregulated (blue) transcripts. See also Supplemental Fig. 1. (B and C) Top 5 significant IPA pathways (p < 0.01 after Fisher’s exact test) associated with up- or downregulated transcripts found within the 1325 blood day 1, 2041 lung day 1, 4810 blood day 3, and 4706 lung day 3 differentially expressed transcripts are shown. Canonical pathways that are common to day 1 blood and lung, to day 3 blood and lung, and to the four datasets are denoted by one, two, and three asterisks, respectively. (D and E) Venn diagram showing the number of overlapping transcripts between blood and lung transcriptional signatures. Further analysis of blood and lung genes associated with acute infection, as defined by both the IPA knowledge base and by GO resources available through the Mouse Genome Database, revealed perturbation of a significant number of genes not obviously associated with the immune response (Fig. 2A). In blood at day 1, of 584 upregulated genes, only 267 (46%) were associated with the immune response, and this was increased at day 3 to 473 of 1522 (31%) total upregulated genes. Similarly, of 829 total upregulated genes in lung at day 1, only 441 (53%) genes were involved in immune function. This increased to 716 immune response genes out of a total of 1795 (40%) genes at day 3 postinfection in the lung. Of 327 genes downregulated in blood at day 1 postinfection, 106 (33%) were associated with immune function, and this was increased to 418 (25%) genes associated with immune function out of 1661 at day 3 postinfection. The functional type of these genes is shown in Fig. 2B. A substantial set of genes was common and similarly perturbed in both blood and lung and day 1 and also at day 3 postinfection (Fig. 2C, 2E). Immune genes are associated with blood and lung transcriptional signatures following acute B. pseudomallei infection. (A) Bar chart of the immune and nonimmune gene distribution within the 911 blood day 1 genes, 3183 blood day 3 genes, 1432 lung day 1 genes, and 3254 lung day 3 genes. (B) Two layer donut chart showing the functional annotation of down, down immune, up, and up immune genes found within blood day 1, blood day 3, lung day 1, and lung day 3 genes. (C) Scatter plot of total blood and lung genes at day 1 derived by combining 911 blood day 1 and 1432 lung day 1 differentially expressed genes. Immune genes (722) are marked in red. (D) Venn diagram showing the common and dataset-specific genes for blood and lung at day 1 postinfection. The number of immune and nonimmune genes is indicated. (E) Scatter plot of total blood and lungs genes at day 3 derived by combining 3183 blood day 3 and 3254 lung day 3 differentially expressed genes. Immune genes (1436) are marked in red. (F) Venn diagram showing the common and dataset-specific immune versus nonimmune genes for blood and lung at day 3 postinfection. Of the genes that were altered in response to infection at day 1, 507 were only expressed in the blood of which 166 (11%) were immune genes, 1028 were only expressed in the lung, of which 349 (34%) were immune genes, whereas 404 were coexpressed in blood and lung of which 207 (51%) were immune genes (Fig. 2D). These numbers were increased at day 3 postinfection with 1947 genes expressed in blood of which only 407 (21%) were immune genes, 2018 were unique in the lung of which 544 were immune genes and 1236 coexpressed in blood and lung, of which 485 (27%) were immune genes (Fig. 2F). Upregulated genes common to both blood and lung at days 1 and 3 postinfection included a large number of chemokines and cytokine genes including IL-27, IL-1, TNF, and IFN-inducible genes, matrix metalloproteases (MMPs), caspase, and ADAM family members. There is altered expression of genes not annotated by IPA/GO as involved in immunity, suggesting these are either physiological changes upon infection, or have an underappreciated role in immunity. We have established a mouse model of chronic melioidosis where mice are intranasally infected with a low dose of the organisms (11), which together with the acute respiratory models described earlier in this paper (1, 2) may represent the spectrum of pathological findings observed in patients with this disease (5). Severity at any one time point ranges from mice with latent infection with no signs of disease, but from which bacteria cannot be detected in the spleen, through to active infection with the presence of high levels of bacterial burden and severe lesions in the spleen (11). To determine whether the blood transcriptome reflects the heterogeneity of disease progression, blood was harvested from chronically infected mice, and RNA was extracted and processed for microarray analysis. Unsupervised PCA analysis of blood transcripts passing detection limits (p < 0.01) showed that samples from uninfected mice clustered together with those with latent infection and away from mice with either moderate clinical severity (grades 1–2) or those with clinical severity grade 3 (Supplemental Fig. 1). Upon statistical filtering (p < 0.01; Mann–Whitney, Benjamini–Hochberg correction of infected versus uninfected mice using GeneSpring analysis) segregated mice into groups, either expressing a strong signature, a weak signature or no signature of over and underexpressed transcripts, as compared with uninfected controls (Fig. 3A). In keeping with the PCA, some mice, although infected showed a blood signature which clustered with that of uninfected controls. Upon analysis of gross pathology some mice were found to have no detectable lesions at this time point and were latent. Mice with detectable lesions, ranging in severity from 1 to 3 showed a strong transcriptional blood signature, confirmed quantitatively using the weighted MDTH algorithm (Fig. 3B) (15). This quantitation using MDTH for measuring the extent of the blood signature correlated with the extent of disease severity based on the spleen lesion score (Fig. 3C). A blood transcriptional signature statistically distinct from that of uninfected mice was detected even in the absence of bacteremia (Fig. 3D). Mice that were chronically infected with low-dose B. pseudomallei could be grouped according to their splenic bacterial burden, latent mice (no detectable bacteria), emerging mice (low levels of bacteria with no clinical illness), and mice with active disease (high bacterial burdens and clinical disease) (Fig. 3E). As shown in the blood, splenic transcriptional signatures again correlated with disease severity (Fig. 3F–H). 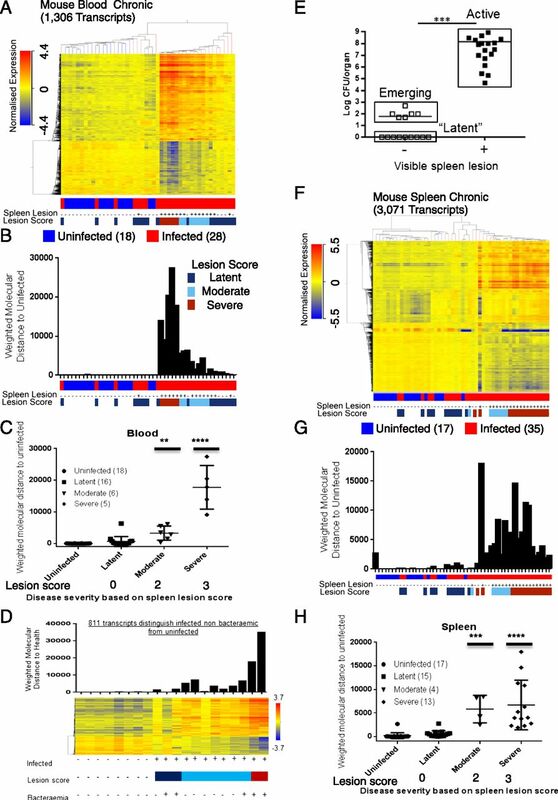 Mouse blood and spleen transcriptional signatures following chronic B. pseudomallei infection reveal differences in latent versus active disease state. 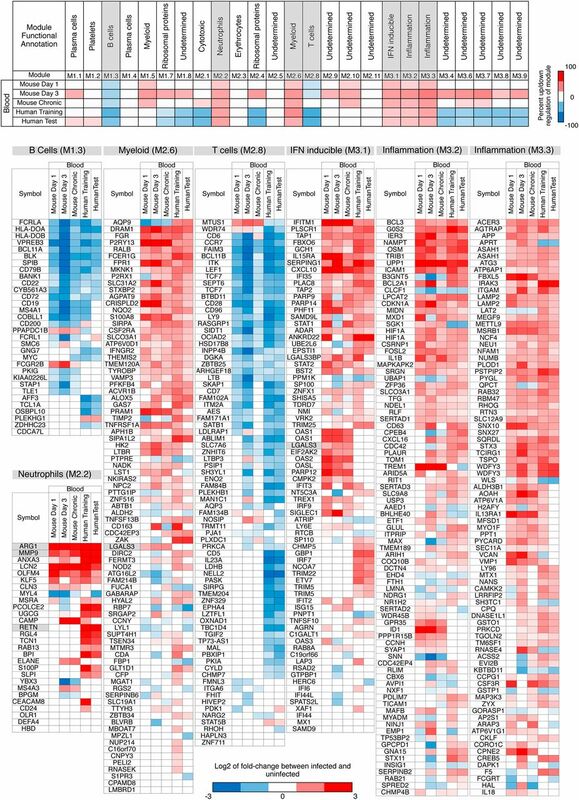 (A and F) Unsupervised clustering based heatmaps of normalized expression values of blood chronic (infected n = 28, uninfected n = 18) and spleen chronic (infected n = 35, uninfected n = 17) differentially expressed transcripts. Scale bar represents log2 fold change of upregulated (red) or downregulated (blue) transcripts. See also Supplemental Fig. 1. (B and G) MDTH is aligned against the hierarchical condition tree generated through unsupervised clustering (top). (C and H) Correlation of individual MDTH to lesion severity score. Horizontal bars represent the median value for each group. (D) Heat map of 811 significant transcripts that were identified by comparing B. pseudomallei–infected mice without bacteremia (n = 7) to uninfected (n = 8). Lesion scores were applied to generate a supervised heat map of the identified transcripts. (E) Bacterial counts from spleens were allocated in two groups according to the presence or absence of visible lesions. Each symbol represents an individual organ. The horizontal line represents the mean (***p < 0.001) between mice with or without visible lesions. Scale bar represents log2 fold change of upregulated (red) or downregulated (blue) transcripts (A, D, and F). Using canonical IPA, many similarities between the blood transcriptome of acute and chronic infection were observed, with the top 5 pathways of upregulated genes comprising granulocyte adhesion and diapedesis, IFN signaling, and TREM1 signaling (Fig. 4A, 4B). The top 5 downregulated pathways in the blood of both chronically and acutely infected mice consisted of genes related to B cell development (Figs. 4C, 1C). Similar and distinct canonical pathways and immune genes are associated with blood and spleen transcriptional signatures in active chronic B. pseudomallei disease. (A) Heatmaps of uninfected versus active chronic infected mice showing unsupervised clustering of 1955 blood chronic (infected n = 16, uninfected n = 18) and 4152 spleen chronic (infected n = 20, uninfected n = 17) differentially expressed transcripts. Scale bar represents log2 fold change of upregulated (red) or downregulated (blue) transcripts. (B and C) IPA of the up- or downregulated transcripts found within the 1955 blood chronic and 4152 spleen chronic differentially expressed transcripts shows the top 5 significant canonical pathways (p < 0.01 after Fisher’s exact test). Pathways that are common to both datasets are marked with a single asterisk. (D) Bar chart summarizing the immune and nonimmune gene distribution within the 1955 blood and 4152 spleen transcripts that map to 1270 and 2756 active chronic blood and chronic spleen genes. (E) Two layer donut chart showing the functional annotation of down, down immune, up, and up immune genes found within 1270 blood and 2756 spleen genes in active chronic infection. (F) Scatter plot of total blood and spleen genes in active chronic infection derived by combining the 1270 blood and 2756 spleen genes. A list of 1044 Immune genes identified within the 3258 total blood–spleen genes by searching the IPA Knowledge Base and GO resources available through MGD are marked in red. (G) Venn diagram showing the common and dataset-specific immune versus nonimmune genes for blood and spleen in active chronic infection. See also Supplemental Fig. 2 for gene lists. (H) Intensity plot of 39 fibrosis genes across B. pseudomallei infected mouse chronic blood and spleen datasets listed above. Scale bar represents log2 fold change of upregulated (red) or downregulated (blue) genes. Asterisks highlight immune genes that are common to chronic blood and spleen. The splenic signature of chronic infection was also dominated by the granulocyte adhesion and diapedesis pathway but additionally included Heme Biosynthesis II, LXR/RXR activation and hepatic fibrosis in the top 5 upregulated IPA pathways (Fig. 4B). The downregulated genes in the spleen of mice after chronic infection were dominated by those involved in T cell responses (Fig. 4C). Of the upregulated genes in blood, 327 (42%) were immune response genes of a total of 774, whereas 532 (34%) of 1571 were upregulated immune response genes in the spleen (Fig. 4D). Of the 496 downregulated genes in the blood, 144 (29%) were immune response genes, whereas 371 (31%) immune response genes out of 1185 were downregulated in the spleen. The functional type of genes altered during chronic infection is shown in Fig. 4E. Many were common and similarly perturbed in both blood and spleen during chronic infection (Fig. 4F). Comparison of the signatures of chronic blood and spleen showed: 502 unique to the blood of which 141 (28%) were immune genes; 768 genes were common in blood and spleen, of which 331 (43%) were immune genes; and 1988 were unique to the spleen of which 572 (29%) were immune genes (Fig. 4G). A large number of the immune genes common to blood and spleen of chronically infected mice again included chemokines, and cytokine genes such as IL-27, IL-1, TNF- and IFN-inducible genes, caspase, and ADAM family members (Supplemental Fig. 2). Consistent with the histological evidence of fibrosis in chronically infected spleens (11), we observed upregulation of numerous genes associated in other systems with fibrosis and tissue remodeling (18, 19), although these genes were invariably expressed to a greater extent in tissue than blood (Fig. 4H). These included collagen-1, multiple MMPs (MMP-2, 3, 8, 9, 10, 12, 13, 14, and 25), IL-1β, IL-6, connective tissue growth factor, chemokines (CCL2, CCL4, CCL6, and CCL8) as well as the Chitinase-like protein BRP-39 (Chitinase 3-like1) and Fizz 2 (RELMβ) (Fig. 4H, Supplemental Fig. 2). To determine which of the mouse models of melioidosis most recapitulated the human disease, we then compared the immune signatures of blood and tissue in mice acutely or chronically infected with B. pseudomallei, with those of human melioidosis cases (15). We first determined the common sets of genes expressed in our Training and Test set human blood samples (1292 genes; Fig. 5A) from patients with B. pseudomallei, who were admitted to hospital with blood culture proven melioidosis (15). Consideration of all genes that were altered in each dataset revealed that 26.9% of the genes perturbed in human melioidosis were also similarly regulated in the mouse models (Fig. 5B). However, the highest level of similarity with human was observed at day 3 post acute infection of mice (Fig. 5B). Of the 26.9% genes commonly affected in both human and mouse blood, of those upregulated 118 were immune, 90 were nonimmune functionally (Fig. 5C). Of the 118 upregulated genes, 50 were commonly affected in all mouse models and the human disease, including Arginase-1, cytokine genes, as well as MMPs, and TLRs (Supplemental Fig. 4). The remainder of upregulated immune genes in the blood of melioidosis patients was similarly affected in at least one of the mouse models of B. pseudomallei infection, again with the acute day 3 transcriptome showing the greatest similarity (Supplemental Fig. 4). Gene level and histology analysis of transcriptional signatures common to mouse–human following B. pseudomallei infection. (A) Venn diagram shows 1292 overlapping genes between the Pankla Training and the Pankla Test set differentially expressed genes. The significant gene lists were identified by stringent statistical filtering comparing blood from diseased individuals to those from healthy controls (Mann–Whitney U test plus Benjamini–Hochberg correction; p < 0.01) on data normalized to the median of all transcripts across all samples and passing a detection value (p < 0.01) and 2-fold expression value across at least 10% of samples within GeneSpring GX12.1 statistical software. (B) Percentage similarity of mouse blood B. pseudomallei infection–associated datasets to human blood 1292 Pankla gene list. The percentages range from 13.6 to 26.9% with day 1 (13.6%), day 3 (22.1%), chronic (14.7%), and total (26.9%) mouse similarity to human Pankla 1292 gene list. (C) Bar chart summarizing the immune and nonimmune gene distribution within 176 d 1, 286 d 3, 190 chronic, and 348 total mouse–human blood genes associated with B. pseudomallei infection. (D) Intensity plot shows the expression of iNos and Arg1 genes across mouse and human datasets. (E and F) Immunohistochemical staining for iNOS and Arginase-1 (center and right columns) of lung (E) and spleen (F) sections from mice, following an acute (day 3) or chronic infection (day 21), respectively. Left columns show isotype controls. Magnified microphotographs on the right show iNOS and Arginase-1 staining from insets in the central columns. Scale bars, 140 μm (left and central columns) and 36 μm (right column). IFN-γ is essential for resistance against infection with B. pseudomallei in mice and is produced by human NK and T cells in vitro, but the role of type I IFNs is not known (20, 21). Consistent with the presence of IFN-γ, we observed significant upregulation of iNOS mRNA in the tissues of both acute and chronically infected mice (Fig. 5D). This was confirmed by immunohistochemistry, where iNOS was shown to be clearly localized to the macrophage rich zones of acute lung and chronic spleen lesions (Fig. 5E, 5F), indicating the presence of M1 or classically activated macrophages. Expression of iNOS mRNA was however not detectable in the blood of infected mice or humans (Fig. 5D). Incongruously, Arginase-1, a functional antagonist of the iNOS-mediated microbicidal pathway and a prototypic M2 or alternatively activated macrophage marker, was highly expressed at the mRNA level in the tissue of acute and chronically infected mice (Fig. 5D). In keeping with the elevated levels of Arginase-1 mRNA, Arginase-1 protein was also observed at high levels in the lung and spleen of acute and chronically infected mice, respectively (Fig. 5E, 5F). Arginase-1 protein was predominantly observed in neutrophils in acute lung lesions, whereas in chronically infected spleen samples it was observed within macrophages. Taken together with the increased expression of Ym-1 mRNA, this suggests that in chronic infection, both M1 and M2 macrophage populations are induced in response to persistent exposure to B. pseudomallei with the latter potentially contributing to the tissue repair and fibrosis observed in these lesions. Of note, in contrast to iNOS, Arginase-1 mRNA was highly expressed in the blood of infected mice and humans (Fig. 5D). IPA was then used to select the top 25 ranked pathways across the human and mouse blood datasets based on their average p value (Fig. 6A; where the total 109 pathways significant at p < 0.05, score 1.31, averaged over the blood transcriptome of human melioidosis and mouse days 1 and 3 acute and chronic melioidosis). The dataset-specific p values are summarized in Fig. 6A and include IL-10 signaling, TREM1 signaling, pattern recognition receptors in recognition of bacteria and viruses and TLRs, corroborating our previous IPAs. Genes associated with IFN signaling were now also observed in both human and mouse datasets using this approach (Fig. 6A). Similar results were obtained by looking at top 10 pathways associated with each dataset (Supplemental Fig. 3). Immune pathways including IFN signaling are significantly associated with mouse and human blood transcriptional signatures after B. pseudomallei infection. (A) Top 25 ranked pathways across human and mouse blood datasets after B. pseudomallei infection based on their average p value. Arrow indicated the IFN canonical signaling pathway shown in (B). See also Supplemental Fig. 3 for IPA top 10 pathways associated with each dataset. (B) Graphic representation for mouse and human blood canonical IFN signaling pathway found within IPA. Fold-change of up- and downregulated genes are indicated with red and blue shading. IFN-γ itself was shown to be upregulated in the blood (Fig. 6B), but only in chronically infected mice, whereas type I IFNs were not. 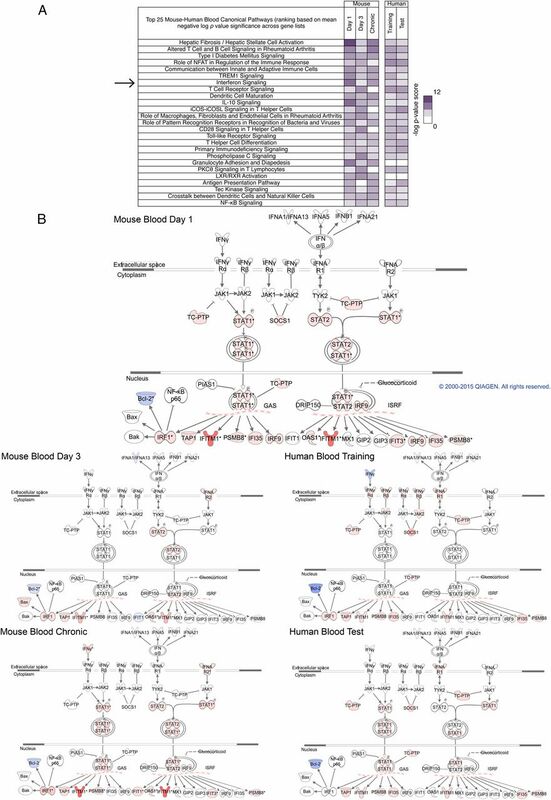 Analysis of expression of genes annotated across all IFN-related IPA-signaling pathways showed clear induction of genes in the blood of acute and chronically infected mice, involving both type I and type II signaling (Fig. 6B). Comparison of these results with the blood of patients with acute melioidosis showed several genes in common to the murine response including SOCS1, STAT1, STAT2, IFITM1, and TAP1 (Fig. 6B). We then compared gene expression profiles in infected mice and humans using a modular data-mining strategy, which analyses clusters of genes that are coordinately regulated (17, 22). The 28 human modules contained from 2 to 192 genes per module, corresponding to 2–183 mouse genes with a range of 75–100% mouse to human homology, depending on the module examined. Modular analysis of our original human training and test sets of human melioidosis samples showed clear changes in gene expression in a total of 18 distinct functional modules with increased expression of IFN (M3.1), inflammation (M3.2 and M3.3), neutrophil (M2.2), and myeloid (M2.6) modules and decreased expression of B- and T-cell modules (Fig. 7). Of these, five of the modules showing upregulation of IFN, inflammation, neutrophil, and myeloid genes were similarly altered in the blood of all of the mouse models of acute and chronic melioidosis. Although B cell–associated genes were shown to be downregulated in both acute and chronic melioidosis, the downregulated T cell–associated genes were only apparently downregulated during acute disease in keeping with the top 10 pathways shown to be downregulated by IPA (Supplemental Fig. 3), although closer analysis of each module demonstrates a number of T cell–associated genes downregulated at all stages of mouse melioidosis that are common with human disease (Fig. 7). 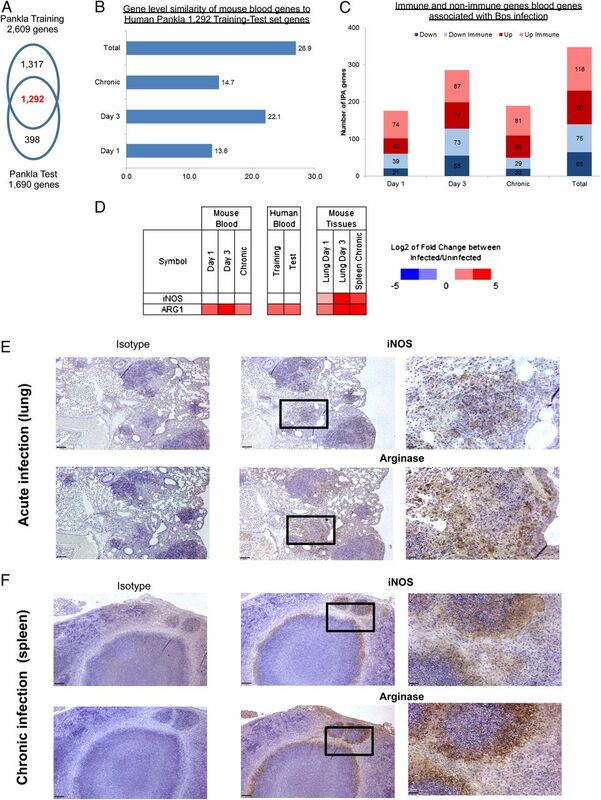 These data demonstrate highly conserved changes across both mouse and human responses in genes associated with IFNs (e.g., IFITM1, SERPING1, and CXCL10), neutrophils (e.g., Arginase 1, MMP9, and LCN2), B cells (e.g., FCRLA, VPREB3, and BCL11A), and T cells (CCR7, BCL11B, and FAIM3) (Fig. 7). Thus, by several different analytical approaches, the host response to B. pseudomallei was dominated by upregulation of genes involved in IFN signaling, phagocyte biology, and inflammation and downregulation of genes involved in B and T cell responses, which was conserved between mice and humans. A number of modules showed discordancy between human disease and the experimental models of melioidosis: one myeloid gene module (M1.5) was not globally similar between mouse and human, overrepresented only in the mouse models (Fig. 7). More detailed inspection of the actual list of genes in that module showed that 20 of 77 of the genes were upregulated in both mouse and human. Discordancy also included underexpression of genes encoding ribosomal proteins in humans, which were either not perturbed or rather overrepresented in the mouse, and six modules consisting of nonannotated genes underrepresented in human disease but not in the mouse models. Modular analysis of blood transcriptional profiles reveals a degree of similarity between mouse and human datasets. Heat map summary of significant up- or downregulation in modules associated with B. pseudomallei mouse and human datasets and passing p < 0.05 after t test comparing infected to uninfected groups (top). Gene-level analysis of modules that are common across the five datasets are detailed from left to right. B cell (M1.3), neutrophils (M2.2), myeloid (M2.6), T cell (M2.8), IFN inducible (M3.1), inflammation (M3.2; top 85 of 149 genes shown), and inflammation (M3.3; top 85 of 164 genes shown). Scale bar represents log2 fold change of up (red) or down (blue) regulated genes. 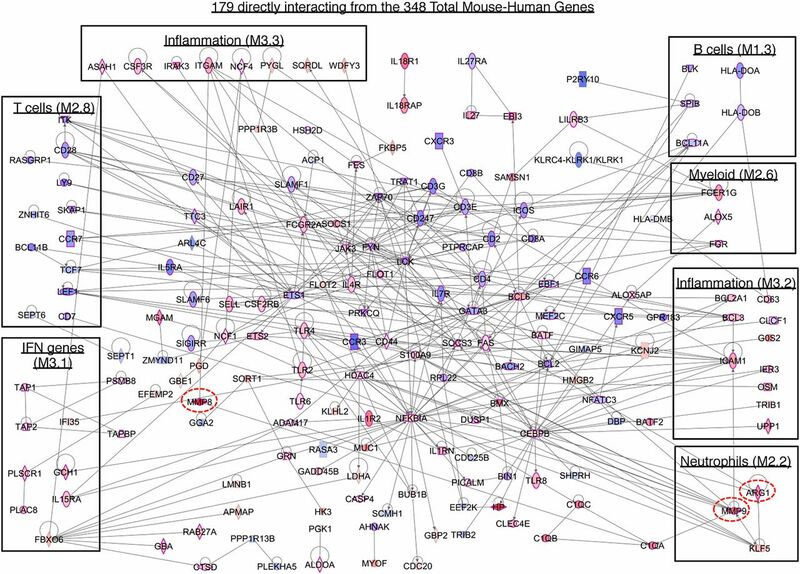 Gene and network level analysis of the 348 common mouse and human B. pseudomallei–associated genes showed 179 directly interacting genes, which included members of modules associated with B cells (M1.3), and T cells (M2.8), which were downregulated versus those associated with Inflammation (M3.2 and M3.3), Neutrophils (M2.2), Myeloid (M2.6), and IFN (M3.1) genes, which were upregulated (Fig. 8). Network level analysis of common mouse–human B. pseudomallei–associated transcriptional signatures. IPA network between 179 of the 348 total mouse–human blood genes. Genes found within modules detailed in Fig. 7 are boxed, whereas 130 genes associated with an immune function are bordered in red. Fold change for up- and downregulated genes is indicated with red and blue shading, respectively. Dotted circles highlight immune fibrosis genes also seen in Fig. 4H and Supplemental Fig. 2. Melioidosis is an increasingly important cause of severe bacterial infection in tropical countries, requiring intense and prolonged antibiotic treatment and for which there is no effective vaccine. Following exposure to B. pseudomallei, a diverse range of clinical outcomes occurs, ranging from prolonged periods of latency to chronic active disease and acute, lethal sepsis. To further our understanding of immunity and pathogenesis of this infection, we have applied whole genome transcriptional microarray to blood and tissues from mouse models, which reflect each of these stages of infection, and compared these profiles to those of melioidosis patients in northeast Thailand. We show that the blood transcriptome in mice infected with B. pseudomallei accurately reflects disease severity in latent, acute, and chronic infection and that the transcriptional signature of disease in mice has substantial similarity to that observed in human melioidosis. Our initial experiments used an established model of acute pneumonia and lethal sepsis following high-dose intranasal challenge of mice with a virulent strain of B. pseudomallei. Transcriptional array analysis of blood showed clear and extensive transcriptional responses in infected but not control mice within 24 h, which increased by 72 h. This included upregulation of numerous proinflammatory gene pathways, consistent with a previous report following i.p. infection (16). There was also coordinated downregulation of genes involved in both B and T lymphocyte development and function, possibly because of the egress of these cells from the circulation or apoptosis, as we have previously described in human disease (15, 22, 23). To date, our understanding of events in the lung leading to severe pneumonia after exposure to B. pseudomallei via the airways has been limited. Wiersinga et al. (24), using a 33 gene probe array, reported induction of several proinflammatory cytokines and chemokines in the lung and bronchoalveolar lavage of infected mice. Our whole genome array approach now shows the full scale of the host transcriptional changes in the lung during the development of acute pneumonia. Within 24 h of exposure to bacteria, some 1400 genes showed altered levels of transcription and over 3200 genes at the later time point of 72 h when clear signs of systemic illness (such as weight loss and bacteremia) were evident. Most of these genes were not annotated as being directly involved in the immune response using a combination of the genes listed in both GO and IPA, presumably reflecting the massive physiological changes occurring during this time. Functional gene types including GPCR, kinases, phosphatases, and transcriptional regulators were annotated in both immune and nonimmune response gene families, with an overabundance of GPCRs and transcriptional regulators associated with the immune response genes postinfection. Consistent with the influx of different leukocytes into the lungs (25), expression of multiple genes encoding chemokines, (including CCL2, CCL7, and CXCL2), cytokines (IL-6, IL-18, and TNF), and the immunoregulatory pathway for IL-10 were increased. Increased expression of multiple genes involved in pattern recognition were also observed, consistent with the important role of MyD88/TLR and other innate recognition pathways to resistance against B. pseudomallei (26). Several gene expression pathways were found in common between lung and blood of infected mice including, TREM1 and IL-10 signaling and granulocyte adhesion and diapedesis. Although acute infection of mice is frequently used to study immunity to B. pseudomallei (2), it does not allow investigation of the latent or chronic phases of melioidosis also seen in humans living in endemic areas. To address this, we established a new model using low-dose intranasal challenge into genetically resistant mice, which leads to prolonged periods of latency but which eventually progresses in all animals to an active chronic infection, characterized by extensive granulomatous lesions in the spleen containing numerous macrophages and lymphocytes (11). Enumeration of the bacterial burden in the spleen of infected animals throughout this process showed three discrete groups: 1) those with undetectable bacteria and no tissue lesions (latent); 2) those with low levels of bacteria but no lesions (emerging); and 3) those with high levels of bacterial burden and obvious lesions (active). Unlike the coordinated and homogenous transcriptional response seen in the acute model, blood from chronically infected mice showed a pronounced heterogeneity in gene expression, which correlated directly with these three stages of infection. A weighted MDTH method showed that during the latent phase of infection, there is no appreciable change in host gene expression above the baseline of uninfected animals, presumably a reflection of the low numbers of bacteria in the tissues not showing an overt immune response. This heterogeneous pattern of gene expression was also observed in the spleen, the main target organ of chronic infection, and again reflected the degree of disease severity as shown by spleen lesion score. 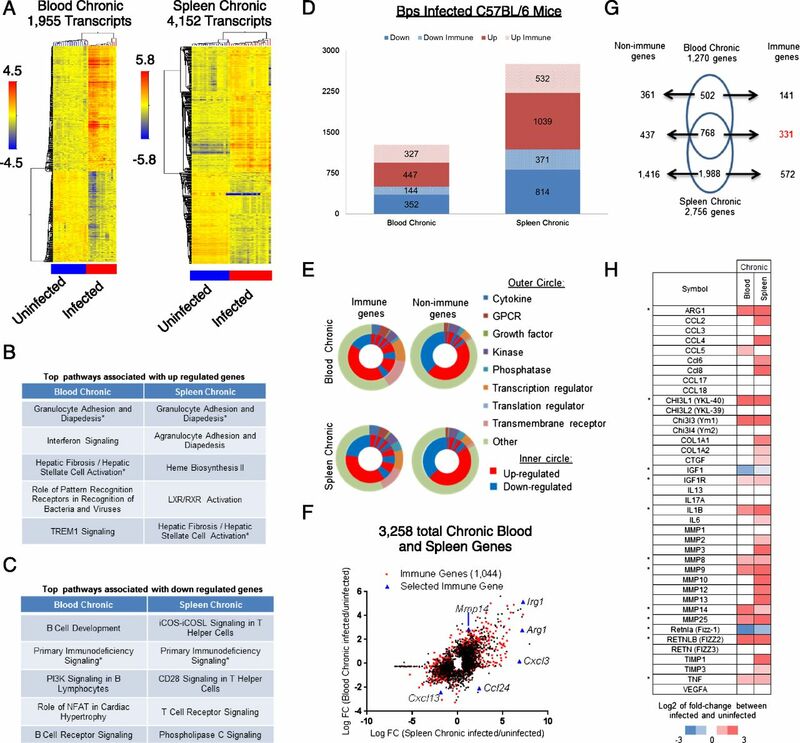 The transcriptional signature of severe chronic disease included expression of multiple genes associated in other systems with tissue remodeling and fibrosis, including MMPs and collagen, at high levels in the tissue and to a lesser extent in the blood, in keeping with our previous report of the prominent fibrosis observed in lesions of chronically infected mice (11). In many bacterial infections, including melioidosis, a significant proportion of individuals present with signs of acute disease because of the presence of foci of bacteria in their tissues but are blood culture negative (15). The inability to confirm the identity of the pathogen poses considerable challenges to the management of these patients and new methods to indicate the presence of infecting organisms are needed. In this study, we show in mice that blood transcriptional arrays were sufficiently sensitive to indicate the presence of B. pseudomallei lesions in tissues, such as liver and spleen, in the absence of bacteremia. This most likely reflects the migration of activated cells from infected tissues into the circulation and/or the activation of blood leukocytes by subcellular fragments of bacteria, such as LPS or cell wall components, released from the lesions. These data suggest that transcriptional profiling may be a useful tool in blood culture negative patients for confirming the presence of infection, predicting the risks of dissemination and systemic illness, and identifying those likely to relapse following antibiotic treatment by indicating the presence of residual tissue foci of infection. Using a combination of analytical methods to interrogate gene expression profiles, including GO, IPA, pathways, and modular approaches, we evaluated the similarity between mouse and human blood datasets associated with B. pseudomallei infection. We first identified a common 1292 gene reference list from two sets of human melioidosis patients (15) that comprised 1131 murine orthologs and then calculated the similarity between human and mouse datasets provided by our different models of acute and chronic B. pseudomallei infection. A 26.9% overlap was observed in the combined acute (days 1 and 3) and chronic B. pseudomallei infection mouse models for the common 1292 genes perturbed in human melioidosis. Furthermore, using a focused pathway or modular approach highlighted several individual top pathways that strongly correlated in human and mouse. IPA pathways with the highest averaged overlap of human genes present across mouse pathways included upregulation of granulocyte adhesion and diapedesis, cross-talk between dendritic cells and NK cells, IFN signaling and IL-10 signaling, and downregulation of genes associated with B cell and T cell pathways. Similarly, infectious disease–based gene modules highlighted that several of them are similarly activated or repressed in human and mouse models. These included the upregulated modules associated with IFN-inducible, inflammation, neutrophil and myeloid genes, and the downregulated modules associated with B cell and T cell genes. Surprisingly, a prominent finding revealed by our transcriptomic analysis of both infected mice and humans was the prominent upregulation in both blood and tissue of Arginase-1, which led us to investigate and confirm its presence at the protein level within the lesions of infected mice. Arginase-1 is known to antagonize the iNOS microbicidal pathway and to inhibit T cell immunity in other infections (27–30) and thus may be a contributing factor to why in B. pseudomallei infection sterilizing immunity is rarely achieved. It has been suggested that mouse models poorly mimic human inflammatory diseases (31). This prompted us to evaluate the similarity of mouse and human blood datasets associated with B. pseudomallei using the methodology adopted by Seok et al. Using the 1292 human gene reference list comprising 1131 murine orthologs, we calculated the similarities between human and mouse datasets by the same approach as Seok et al. (Pearson correlation, R2). We obtained R2 correlations of 0.95 (human Pankla Test), 0.17 (mouse blood day 1), 0.15 (mouse blood day 3), and 0.15 (mouse blood chronic) when fold-change values of patients to healthy within the Human Pankla Training dataset were taken. The weak correlation values between 0.15 and 0.18 are higher than the human–mouse correlations of 0–0.08 reported by Soek et al. In contrast, the murine mouse models of melioidosis strongly correlated with each other (R2 = 0.60–0.62). Using this approach, we obtained strong (R2 ≥ 0.95) correlation values for human–human comparisons and weak (R2 ≥ 0.14–0.18) correlations for human–mouse comparisons. Seok et al., however, reported stronger (R2 ≤ 0.49) human–mouse correlations in individual top pathways, indicating that certain key genes and pathways illustrate similarities between mouse models and human disease, and could help to develop improved animal models. Indeed, our unbiased approach using complementary bioinformatic tools, including GO, pathway, and modular analyses, demonstrates that there are clear similarities between mouse and human immune responses, as measured by the blood transcriptome, to B. pseudomallei infection. Furthermore, of the 348 genes commonly perturbed between mouse and human, 51% were predicted to be directly interacting, the majority of which were involved in immune responses. Taken together, we show that the level at which one compares human–mouse transcriptional datasets can lead to disparate conclusions regarding the similarity of mouse models to human disease. Perfect correlation between murine and human data should not be expected given the nature of the experimental versus clinical conditions. With the human dataset, there is heterogeneity at the individual level, not only in terms of underlying genetic makeup of the individuals but also with regard to the dose received of infectious agent, variance in the virulence of the pathogen, as well as variation in the time of sampling during the course of infection, all of which cannot usually be determined in humans under noncontrolled conditions. In addition, there is additional heterogeneity according to the time of initiation of treatment and type of treatment. In contrast, greater control is possible over these variables (pathogen strain, pathogen dose, mouse strain, time postinfection, and balanced control of experimental groups) in murine models that allows for the in-depth analysis of perturbed gene expression. Thus, although comparisons of human and mouse models of disease at the level of a global list of significantly expressed genes from human disease models may poorly correlate with expression profiles from mouse disease models, the identification of key genes or pathways shared in the response in murine and humans may reveal known and potentially novel immune response mechanisms following infection by a pathogen and may help to identify biomarkers relevant to the interplay between host and pathogen. The development of more focused approaches such as modular analysis developed in diverse mouse models is needed for interpreting and further developing animal models of human disease. Our data not only provide new information on the pathogenesis of this infection but also demonstrate that a complementary set of bioinformatics approaches can provide valuable and novel insight into the conserved response pathways in mouse and human, validating mouse models of human disease and providing approaches to improve them. We thank R. Gilbert and the London School of Hygiene and Tropical Medicine Biological Services Facility for animal husbandry. We also thank A. Sesay, H. Jani, and the High Throughput Sequencing Facility (The Francis Crick Institute, Mill Hill Laboratory) for microarray. This work was supported by European Research Council Grant 204682 and TB-PATH (to K.P.). A.O. and C.M.G. were funded by Medical Research Council (U.K.) Grant U117565642. The mouse microarray data are deposited in the Gene Expression Omnibus database (http://www.ncbi.nlm.nih.gov/geo/) under accession number GSE61106. Copyright © 2015 by The American Association of Immunologists, Inc.
. 2006. Melioidosis: insights into the pathogenicity of Burkholderia pseudomallei. Nat. Rev. Microbiol. 4: 272–282.
. 2012. Melioidosis. N. Engl. J. Med. 367: 1035–1044.
. 1992. Prolonged elevation of interleukin-8 and interleukin-6 concentrations in plasma and of leukocyte interleukin-8 mRNA levels during septicemic and localized Pseudomonas pseudomallei infection. Infect. Immun. 60: 2402–2408.
. 1999. Elevated plasma concentrations of interferon (IFN)- γ and the IFN-γ‑inducing cytokines interleukin (IL)-18, IL-12, and IL-15 in severe melioidosis. J. Infect. Dis. 180: 1878–1885. 2003. Melioidosis. Lancet 361: 1715–1722.
. 2006. Risk factors for recurrent melioidosis in northeast Thailand. Clin. Infect. Dis. 43: 979–986.
. 1975. Melioidosis: recrudescence associated with bronchogenic carcinoma twenty-six years following initial geographic exposure. Chest 68: 261–263.
. 2006. Role of T cells in innate and adaptive immunity against murine Burkholderia pseudomallei infection. J. Infect. Dis. 193: 370–379.
. 2008. Burkholderia pseudomallei aerosol infection results in differential inflammatory responses in BALB/c and C57Bl/6 mice. J. Med. Microbiol. 57: 508–515.
. 2008. Burkholderia pseudomallei: animal models of infection. Trans. R. Soc. Trop. Med. Hyg. 102(Suppl. 1): S111–S116.
. 2011. Low-dose exposure of C57BL/6 mice to burkholderia pseudomallei mimics chronic human melioidosis. Am. J. Pathol. 179: 270–280.
. 2006. Role of inducible nitric oxide synthase and NADPH oxidase in early control of Burkholderia pseudomallei infection in mice. Infect. Immun. 74: 6300–6309.
. 2011. Glyburide is anti-inflammatory and associated with reduced mortality in melioidosis. Clin. Infect. Dis. 52: 717–725.
. 2013. Host responses to melioidosis and tuberculosis are both dominated by interferon-mediated signaling. PLoS One 8: e54961.
. 2009. Genomic transcriptional profiling identifies a candidate blood biomarker signature for the diagnosis of septicemic melioidosis. Genome Biol. 10: R127.
. 2010. Genome wide transcriptome profiling of a murine acute melioidosis model reveals new insights into how Burkholderia pseudomallei overcomes host innate immunity. BMC Genomics 11: 672.
. 2008. A modular analysis framework for blood genomics studies: application to systemic lupus erythematosus. Immunity 29: 150–164.
. 2015. Role of Chitinase 3-like-1 in IL-18‑induced pulmonary type-1, -2 and -17 inflammation, alveolar destruction and airway fibrosis in the murine lung. Am. J. Respir. Cell Mol. Biol. In press.
. 2013. Host responses in tissue repair and fibrosis. Annu. Rev. Pathol. 8: 241–276.
. 1999. Obligatory role of γ interferon for host survival in a murine model of infection with Burkholderia pseudomallei. Infect. Immun. 67: 3593–3600.
. 2009. Phenotypic and functional characterization of human memory T cell responses to Burkholderia pseudomallei. PLoS Negl. Trop. Dis. 3: e407.
. 2010. An interferon-inducible neutrophil-driven blood transcriptional signature in human tuberculosis. Nature 466: 973–977.
. 2013. Transcriptional blood signatures distinguish pulmonary tuberculosis, pulmonary sarcoidosis, pneumonias and lung cancers. PLoS One 8: e70630.
. 2008. Gene-expression profiles in murine melioidosis. Microbes Infect. 10: 868–877.
. 2007. A critical role for neutrophils in resistance to experimental infection with Burkholderia pseudomallei. J. Infect. Dis. 195: 99–107.
. 2007. Toll-like receptor 2 impairs host defense in gram-negative sepsis caused by Burkholderia pseudomallei (Melioidosis). PLoS Med. 4: e248.
. 2015. Mature cystic fibrosis airway neutrophils suppress T cell function: evidence for a role of arginase 1 but not programmed death-ligand 1. J. Immunol. 194: 5520–5528. 2009. Arginase: an emerging key player in the mammalian immune system. Br. J. Pharmacol. 158: 638–651.
. 2009. l-Arginine deprivation impairs Leishmania major‑specific T-cell responses. Eur. J. Immunol. 39: 2161–2172.
. 2009. Local suppression of T cell responses by arginase-induced l-arginine depletion in nonhealing leishmaniasis. PLoS Negl. Trop. Dis. 3: e480.
. 2013. Genomic responses in mouse models poorly mimic human inflammatory diseases. Proc. Natl. Acad. Sci. USA 110: 3507–3512.